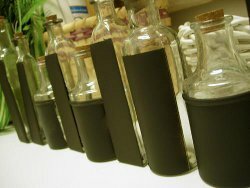 Don't get rid of those old bottles! Instead, make a recycled craft project everyone will love! 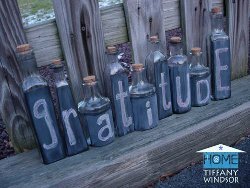 Chalkboard Paint Bottles from Tiffany Windsor are a great way to show your creativity. 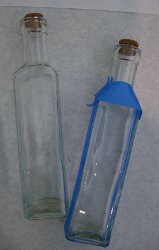 Clean bottles with alcohol to remove any residue. Mask off painting areas with masking tape. Add variety by masking off areas of different sizes. 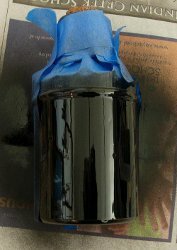 Spray glass bottle with chalkboard paint. Be sure to keep the nozzle moving back and forth to keep paint from dripping. Also be sure to protect all areas that you do not want sprayed. Don’t skimp on this step because you will get overspray. 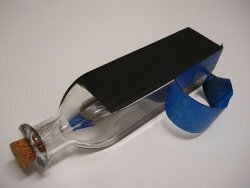 Once your second coat is dry to the touch, carefully remove tape to reveal sprayed area.If you have any overspray, use craft knife to gently remove from glass. 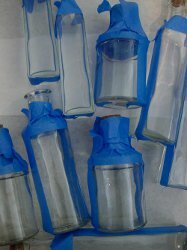 Let bottles sit overnight to dry completely. One the chalkboard paint is completely dry, I like to “season” the paint by gently rubbing the side of the chalk over the paint. 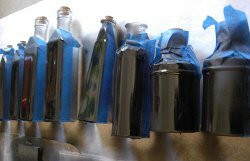 BE VERY CAREFUL because you can easily scratch the paint off the bottle. Use a gentle touch. I found the side of the chalk is softer than the ends, especially on new chalk sticks. 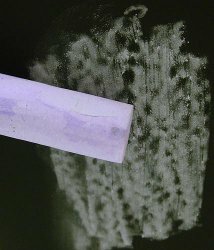 On some chalk sticks, it also helps if you rub the stick on a plain piece of paper first to remove the harder outside coating. After you have applied some soft chalk to the paint, use your finger to gently wipe it away coating the entire sprayed surface with chalk. 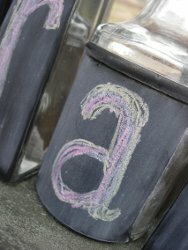 Again, using a soft side of the chalk, gently draw on lettering with chalk. Use several colors for a fun look. What a neat idea. Where do you find spray chalkboard paint? After the bottles are dry and you season the bottles, is there a specific type of chalk to use? I applied 2 coats using a spray chalkboard paint already and tried one chalk and it was taking off the black. Some sites in comment sections mention that you should avoid the non-toxic chalks, etc. Does this really matter?